Women in the North West of England can now donate their baby’s umbilical cord blood and placentas at the first donation facility of its kind in the region. St Mary’s Hospital, Manchester has been chosen by Anthony Nolan to collect the donations as they roll out their cord blood donation programme. 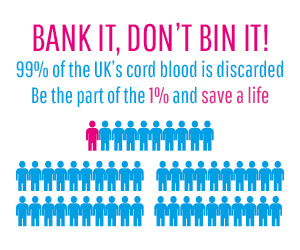 Previously, cord blood collection centres were clustered around London and the Midlands. However, the recent introduction of two Nottingham hospitals, Queen’s Medical Centre and Nottingham City Hospital, and now the introduction of facilities in Manchester show Anthony Nolan’s commitment to making umbilical cord blood donation accessible across the country. The cord blood collected at Manchester will be used for two purposes. The samples donated with a high stem cell volume will be used for transplant and can be stored for more than 25 years until a suitable recipient is found. Samples deemed not suitable for transplant will be used for research, giving the unit another opportunity to be used to save a life. 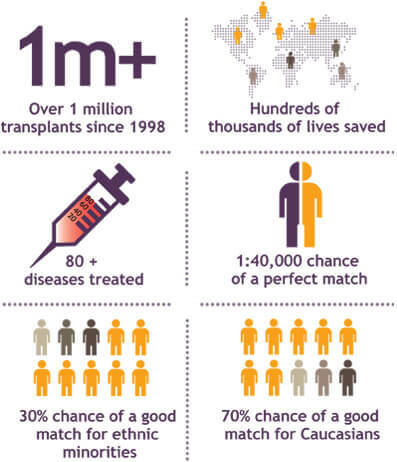 In the case of transplant, the cord blood units will be used to give precious stem cells to those in need. The stem cells will help to rebuild the immune system by creating new, healthy blood cells after treatments such as chemotherapy. Cord blood donations need to be HLA matched to patients in order to minimise the risk of rejection by the patient’s body. HLA matching is a complex process in which race and ethnic heritage play an important role. The mixed race population in the UK is growing incredibly quickly. Unfortunately, ethnic minorities including the mixed race community, is under-represented in public banks. Manchester has a rich tapestry of ethnic diversity. The new facilities at Manchester should provide a welcome boost to stem cell matches for people in need from these communities. Find out more about banking your baby’s cord blood and securing the long term health of your family or someone in need here. I wish there were hospitals down in the South of England that accepted donations – it is such a waste!